Tracking changes and impact analysis is a common task in the field of requirements traceability. It helps you e.g. to find out which requirements changed in a given period of time, it identifies the particular changes and their impact. YAKINDU Traceability supports such tasks by means of our newly introduced snapshot feature. This post explains what a snapshot is and how snapshots can be compared. In YAKINDU Traceability, a snapshot is a “frozen copy” of the current state of your traceability data. It comprises all artifacts such as requirements, test cases, source code, etc., the traceability links between those artifacts and the current configuration of the tool. YAKINDU Traceability stores these snapshots in files on your disk, so you can share snapshots e.g. via your version control system. You can load snapshots and browse the “frozen data”. In snapshot mode, YAKINDU Traceability shows the artifacts and links that had been saved in the snapshot. You can analyze e.g. the requirements traceability of the snapshot by means of reports – you even can create and execute custom ad-hoc queries. The difference to the standard mode is that you cannot modify artifacts, links or the YAKINDU Traceability configuration. As the tool behaves nearly similar to the standard mode, you might not notice that you are in snapshot mode. We added a big title bar to keep things clear. 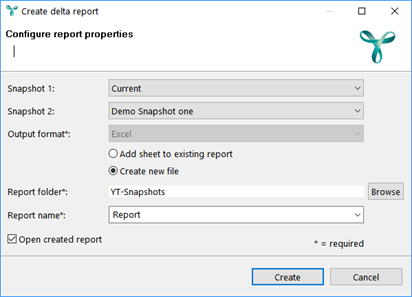 The delta report lists all differences either between two snapshots or between a snapshot and the “current” state of your traceability data. The Statistics sheet lists the total number of artifacts and links in the respective snapshots and the number of identified changes. Potential changes are changes of attributes or artifacts or links or removals/additions of artifacts or links. The Changed Artifacts sheet lists the changes of artifacts and their attributes in detail. Same applies to the Changed Links sheet, except that it lists links instead of artifacts. This is not the end of the story. We won’t stop improving the YAKINDU Traceability tool. Imagine e.g. a change in the definition of an attribute of your requirements – should deltas that are a consequence of the configuration change, but not of a data change, be visible in the report? Did you ever wonder how a delta can be visualized, e.g. how a deleted link is drawn in the visualization of the traceability graph? I've been working as (technical) project manager in several business domains. I like the power of language engineering and every other application that makes development easier and improves quality. Since 2014, I'm in charge of YAKINDU Traceability.